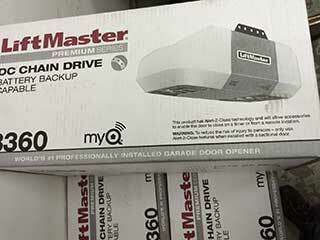 Your garage door opener is the most complicated part of your whole overhead door system; these complex units combine a variety of sensors and drives so that your door moves smoothly and reliably each time you need it. We work with the best opener manufacturers in the country to supply our customers with reliable, durable and convenient technology. Many of these brands have integrated a range of smart new features into their product ranges, which we love. Read on to learn more about our 3 favorite examples of new opener technology! Chamberlain’s new line of openers incorporates Wi-Fi connectivity. This means they can link up with your home network, giving you the ability to control the system remotely via your smartphone. You can open or close the door from almost anywhere in the world, meaning you’ll never have to worry about leaving the door open when you leave for work. The MyQ system also integrates with other smart home technology and can interface with Nest, Google, Apple and IFTTT for a wide range of applications. Many modern opener brands, like LiftMaster, incorporate HomeLink integration into their new products. HomeLink is a replacement for your existing garage door opener which means it’ll always be on hand to you when returning home in your car. Instead of a small, easily-lost remote control, HomeLink is installed directly into your car’s controls. Simply by pressing the Up or Down button you can tell your overhead door to open or close without fumbling around in the glove compartment for the opener you’re sure you left there this morning. Modern garage doors are tough, and fitted with many security features that make it hard for intruders to break in. However, some have found ways around this by duplicating the signal of your garage door remote control. With the right equipment, intruders don’t have to worry about cutting through your expensive locks; all they have to do is press a button. Companies like Genie and LiftMaster have got wise to this by integrating “rolling code” technology into their new openers. Each time the door is used, the code gets reset so, even if someone finds a way to copy your remote’s signature, they still won't gain access. There are plenty of reasons to invest in a new opener - increased security, better convenience and more reliability. If you’re thinking of replacing your door’s opener, contact Garage Door Broken Spring Orlando today to find out how we can help you.